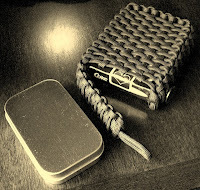 I wanted to make a paracord pouch for a deck of playing cards and it just worked out to also fit an Altoids type survival tin. 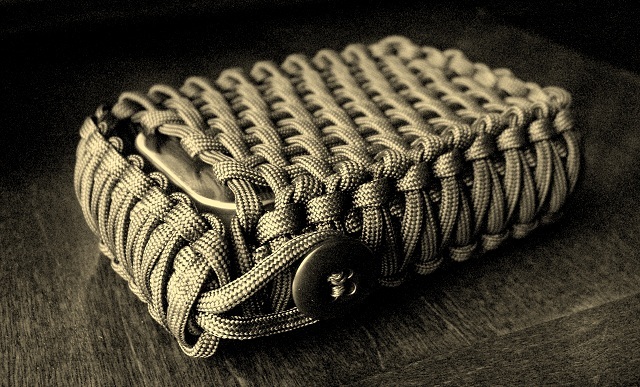 I started with a long Solomon bar/cobra stitch/Portuguese sinnet, with some olive drab paracord, 16 feet I think, that fit around the outside dimensions of a standard deck of playing cards inside their box, which was about 15+ inches with the loop end to be used with a BDU button closure. I tried weaving the sides at that point with another length of paracord, but found the Solomon bar wasn't wide enough, so I started over, making another wider bar, but that wasn't quite right either, and I finally decided on a doubled Solomon bar/king cobra stitch, done just loose enough to allow weaving around the bights/edges. 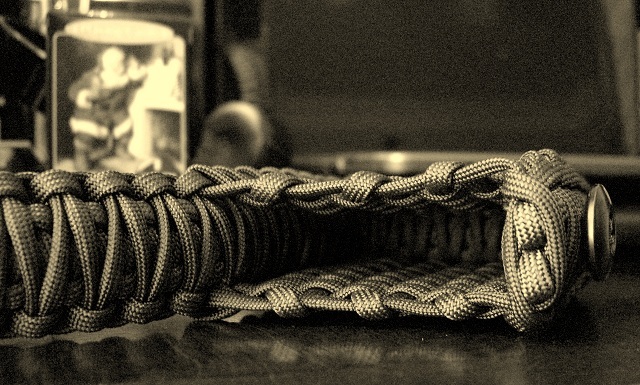 I retied the olive drab Solomon bar then added the second layer with a 40 foot length of black paracord. This turned out to be long enough for doubling the bar and the remaining strands on each side were long enough to do the weaving on each side of the pouch. The doubled bar and weaving is all one single length of paracord, and I just had a little bit of paracord left to trim off each side at the finish. The weaving process was done with running the working strands back and forth through the edges of the bar, while I held it around the deck of cards, giving the pouch it's shape. I went from the top, going side-to-side to the bottom edge of the pouch, then wove the strand over/under from the bottom to the top horizontal strand at the open end, then back down, six times on each side of the pouch. Note that there needs to be a bit of slack in the cords to be woven around as they'll tighten up as you work. You can go back afterwards and work the slack out and straighten out the overs/unders to neaten it all up. After weaving there was enough room for one more horizontal weave along the bottom edge on each side, then I used needle and thread to secure the ends, trim and tucking those, and then sewing on the BDU button. The top of the woven sides doesn't quite run straight across the sides, so if I make another, I'll try to get that worked out, but other than that leaving a bit of a gap with the top flap, I'm satisfied with the pouch. 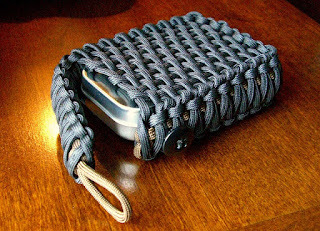 Another piece of cord could be added to one side of the pouch for a belt loop, but I'm leaving this one as is. 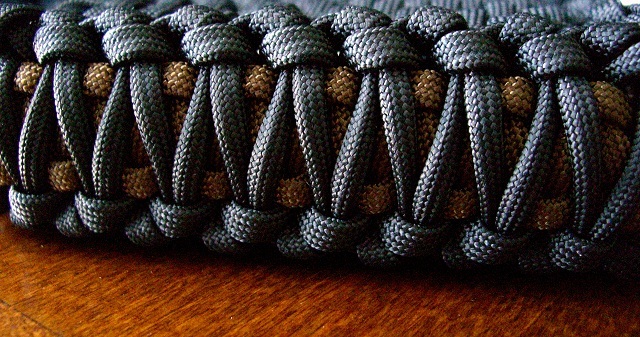 Various different knotted/woven paracord bracelet patterns could be used instead of a king cobra/doubled Solomon bar, as long as they're wide enough and have suitable edges to weave the cord around. Also shown used as a front pocket pouch for carrying my Leatherman Wave, Titanium Widgy Pry Bar, and JETBeam AA LED Flashlight. I may try cutting up a plastic/nylon notebook cover to rig up a divider for individual slot compartments. Not a full tutorial, but I added a collage of process photos for making the pouch. Clicking on the photo will enlarge it, and sometimes right clicking and choosing 'view image' will offer the largest available image to see more detail. The starting cobra stitch/Solomon bar/Portuguese sinnet tied in red paracord was 15.5 inches long to fit around the deck of cards, using just a tad over 15 feet of cord, and after working the slack out and straightening the woven sections, a little over 38 feet of navy blue paracord was used of the 40 foot length I started with. The star knot was tied with another strand of cord and the strand from it worked over and around the knot below it to secure it, with the excess tucked inside the pouch. I've added a few more pics/collage of the start, with the 15" long Solomon bar/cobra stitch section with 2" loop at the end, which fit around my standard deck of playing cards in their box. Shown loosely fitted around the box to gauge fit, the ends of that knotted length of cord can be trimmed then sewn, melted, or glued in place, or tucked/pulled under with hemostats then trimmed. Next is starting the double Solomon bar/king cobra stitch from the loop end with the center of the 40' length of paracord. 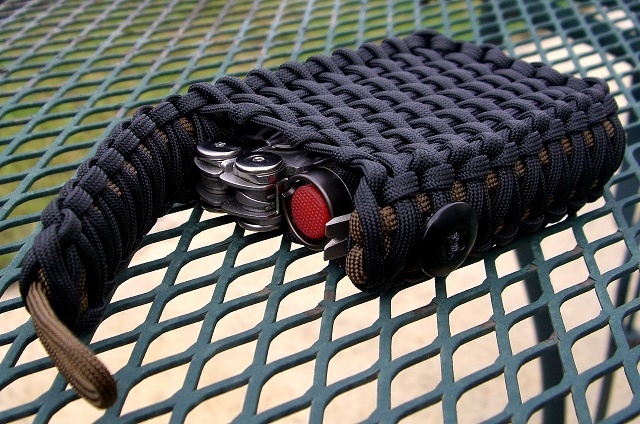 You could do the entire project with one longer continuous length of paracord instead of two, and if I'd done that, I would probably use a 60 foot length to start for a pouch that fit the playing cards. More paracord would certainly be needed for a larger pouch, it really will vary depending on the object you're tying it around. I think I'll do one of those for my iphone. Thanks for the idea. That is an awesome idea. I've got a ton of Altoids cans that I use for mini-survival kits and to keep char cloth/fire starter materials in. Thanks for the idea. I'll be adding this to my to-do list! @Parker, Learning knot work is a never ending process of practicing tying things you see and exploring new ways to use old knots, and like JD of TIAT and others in the growing knotting community, sometimes creating new ones. SD - wow! 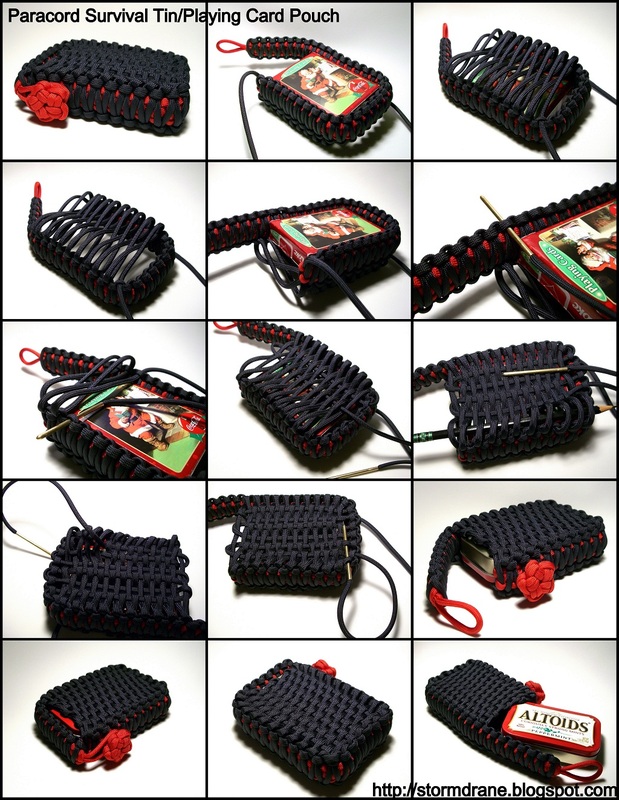 This is probably the craziest paracord project I've seen from you in a long while. Very cool. I love the idea for a zippo cover, that would be sweet. I need something for the Ipod and accessories, that would work nicely I think. Wow! That is really awesome work! I'm new to this, but I love making projects out of altoids boxes (like solar powered battery USB packs) and giving them to friends as gifts. 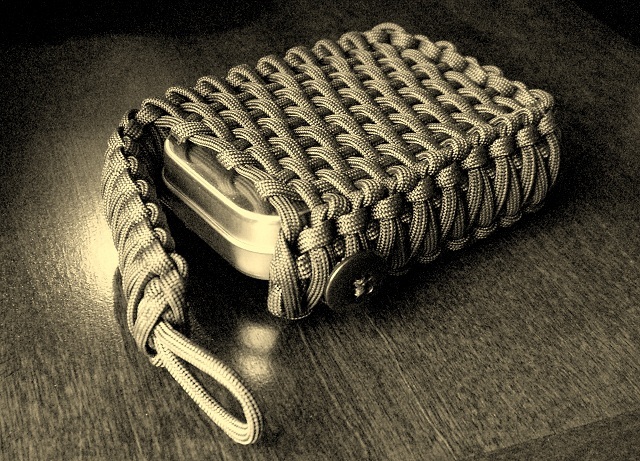 Adding a paracord wrap to the altoids tin would be an even better gift. 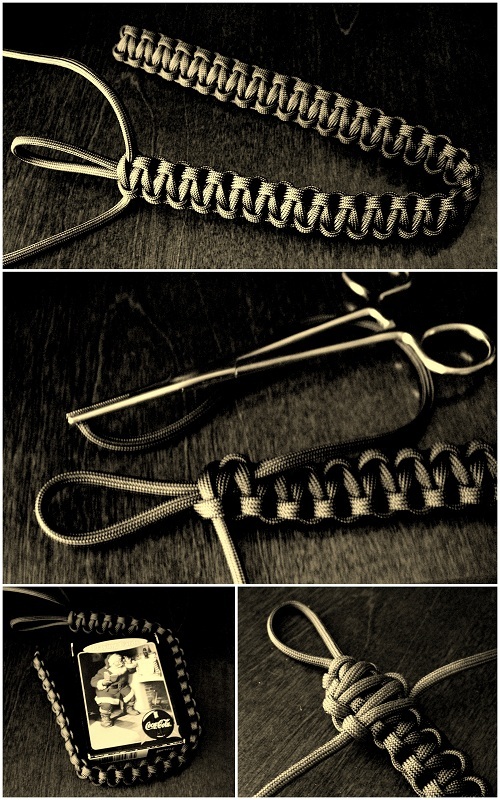 @Anonymous, This project might be a bit much for a beginner, probably more appropriate for someone that has at least tied a few basic paracord bracelets and maybe done a bit of weaving. There are so many variables depending on what object you're going to tie the pouch around and possible finishing methods, that I haven't explored them all myself yet to decide on which I like best. Of what I've shown so far is using two strands of paracord, but using just one length is feasible as is using multiple different colors is too. @Brenden, It may take several hours from start to finish the first couple of times you tie one, but once you know what you're doing, the amount of time involved comes down considerably with less guess work. The weaving can get very tight, and appear uneven, but if you left enough slack before starting, it's still doable, and you can go back and tighten/straighten everything out. 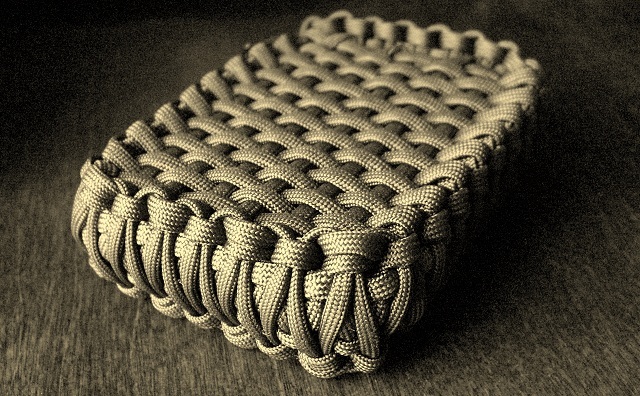 Love this blog and it is what inspired me to start weaving para cord. Stormdrane I would be honored if you would look at my blog and give me your opinion of my work. 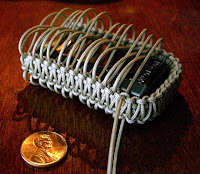 Cobraweave.blogspot.com also what kind of needle are you using for this project and where did you pick it up? @Bryan, Your knot work looks good. I'd suggest taking and sharing lots of pictures, that's something that keeps me interested when surfing blogs. how do you do the weaving on the case? I am trying to make something similar because this is awesome. the only thing I can't figure out is how you did the actual weaving. 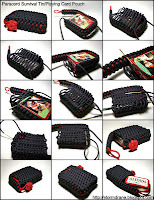 @karsten, The weaving is done after the outer frame knot is done, king cobra/doubled Solomon bar, and the working strands on each side are used to go loosely side to side from the top of the pouch to the bottom, as shown in the photo collage. Hi, are there video tutorial? I try, but I make always mistakes. @Anonymous, I have not made a video tutorial. 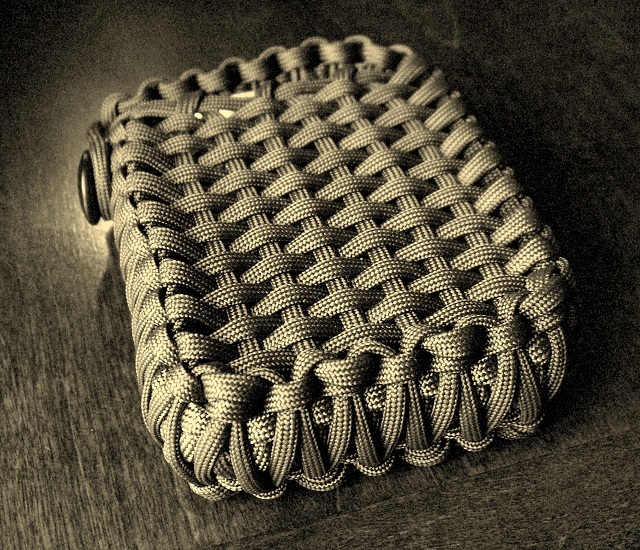 You can search on YouTube for others that have made similar paracord pouches with slight variations. i would love it if you could post better instructions we tried making one and it hasnt turned out like yours. better instructions or even a video of you making one would be great! 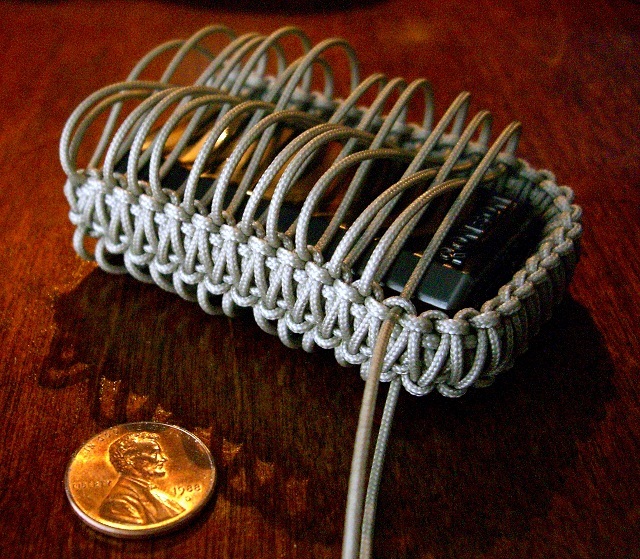 Awesome, I made one a few years ago for my iPhone but only used single cobra. Double is perfect. Awesome a lot of applications; survival pouch, money pouch, card holder, phone, endless...this is awesome. Hey Stormdrane, I am a big fan of your knot work. I'm just curious where you get your smaller cord, such as your 1.4 mm cordage? Thanks. Those links really helped me find what I was looking for! 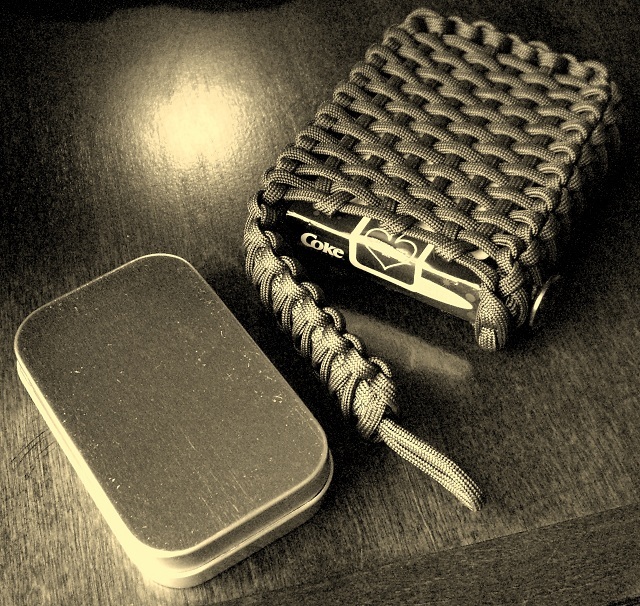 @Anonymous, A paracord Zippo case could be made, but because of the lighter size and the paracord diameter, it would not look like the card/tin sized version. Dave you do great work. Do you have a website where I can buy a few of these for my survival tins? I don't make them to sell, instead encourage folks to give knot work a try themselves. There is the description and some pics of the process in the blog post to go by, and at least a couple of others have since made tutorials on instructables and maybe youtube.